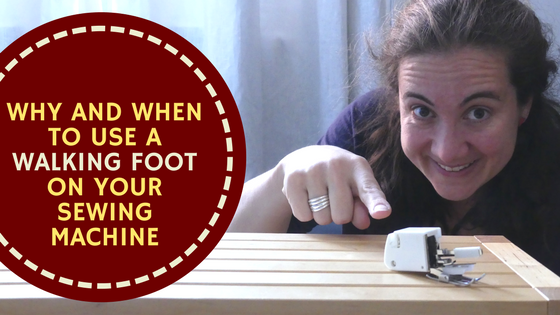 The Walking Foot is a rather big presser foot that gives your sewing machine super powers. It gives you an extra set of feed dogs for the top of the fabric being sewn. Using this foot makes managing unusual fabrics manageable. Sewing matching plaids becomes simple. 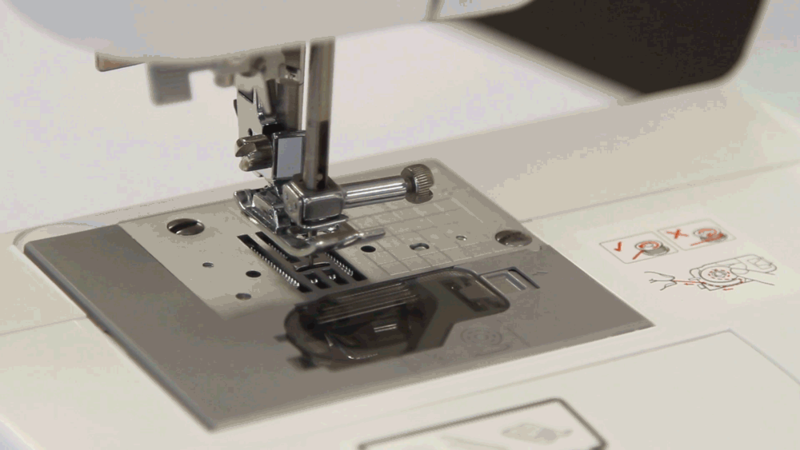 Knits flow through your machine without growing. Slippery fabrics like minky cloth don’t slide all over the place. Thick multiple layers in bulky projects like quilts walk nicely together. Read on to find out why you do need this presser foot. And also if you already have one I bet you will get some new ideas on extra uses for this amazing sewing tool. These 2, 3 or 4 teethed bars move back and forth in slots in the needle plate of your sewing machine. Their purpose is to pull (feed) the fabric through the machine. Why a walking foot? 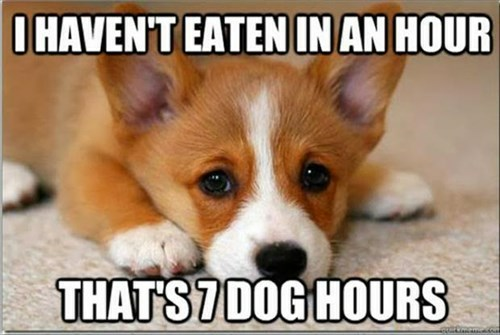 Why those extra feed dogs? When working with one or two layers of fabric, those feed dogs underneath move everything along just fine. But when you're working with multiple layers, like in a quilt, the top layers may not be moving as fast or as easily as the bottom layers next to the feed dogs. This also becomes an issue when working with thick fabrics like fur or leather or with sticky fabrics like oilcloth and vinyl. Below is a rendering taken from a blog post by Andrea Brown of how a regular presser foot moves your fabric differently than a walking foot. A regular presser foot presses down on and slides along the top of your fabric, which means it’s sometimes pushing AGAINST the fabric , especially bulky fabric, as the feed dogs are trying to move the fabric toward the back of the machine. A walking foot, however, corrects this by scooting the top layer at the same pace as the bottom layer, so there’s no misalignment. 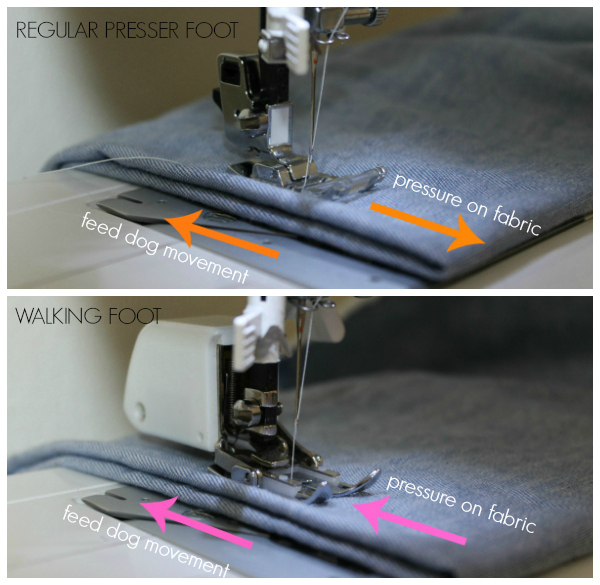 The feed dogs from the foot grips onto the top layer of fabric and helps move it under the needle at the same pace that the machine’s feed dogs are moving the bottom layer of fabric. This prevents shifting and puckering that may occur with a normal presser foot. Because of this feature, the walking foot is just as useful for garment sewing as it is for quilting. 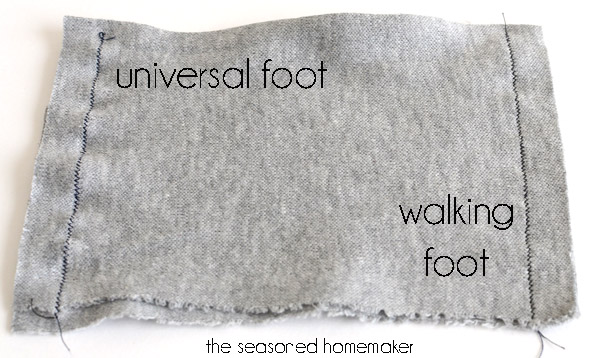 Think a walking foot is a quilters-only sewing tool? Think again! 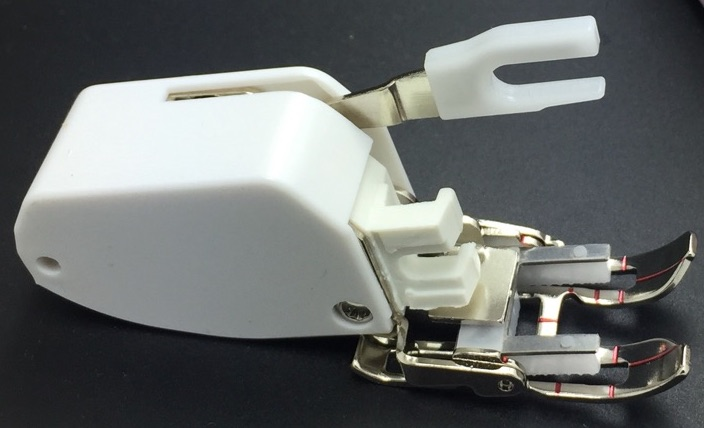 Of course it is a great tool to help a quilter with all sorts of machine sewing like stitch-in-the-ditch stitching, straight-line quilting, adding a quilt binding or when quilting with minky or other slick or knit fabrics. 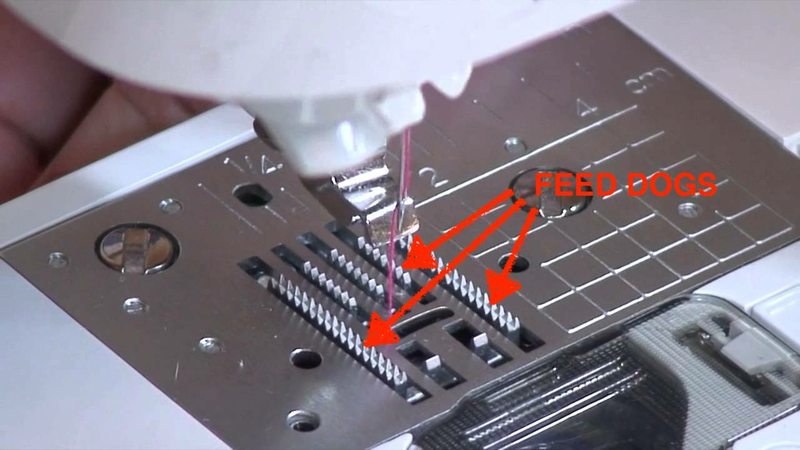 However also whenever you are topstitching through multiple layers or trying to match plaids across seams, the walking foot’s even feed function can help you achieve professional results! Below I have listed the most important uses for the walking foot. A walking foot helps when sewing a garment that has a pattern or directional print that needs to be matched across major seams. 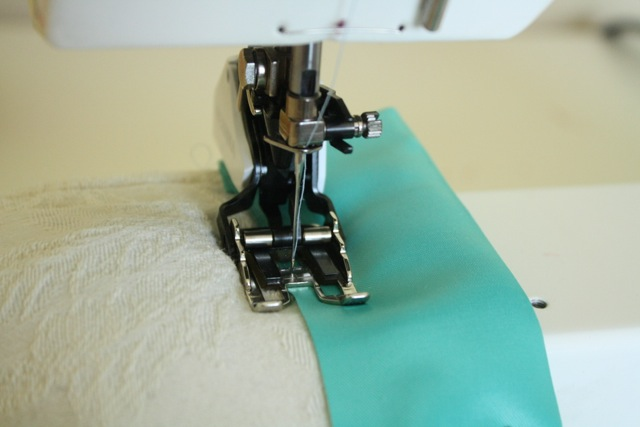 If you take the time to cut and pin your pieces so the prints will align nicely across seams, the walking foot will make sure that those pieces will move through your sewing machine without shifting. Because of the stretchy nature of knit fabrics, they have a tendency to … well … stretch under the presser foot as you sew. This is especially true when you’re sewing along the direction of stretch, such as on the hem of a T-shirt, or sewing with very stretchy fabrics, such as rib knit. A walking foot helps move knit fabrics evenly so they don’t stretch out of shape. The walking foot eliminates the need for excessive pinning when working with slippery fabrics. That is especially useful because most of those slippery fabrics, such as satin, are easily damaged by pins. Have you ever noticed mysterious drag lines within your hem or button placket after you topstitched it down? Sometimes a blast of steam helps settle the fabric, but sometimes the problem persists. 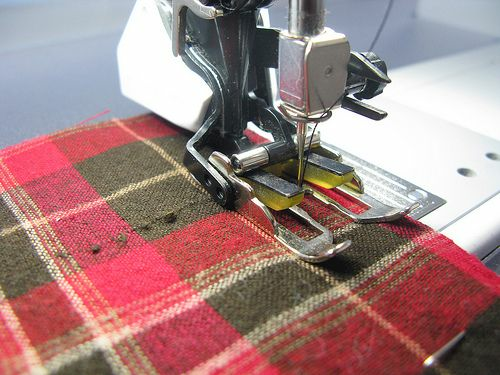 Even with careful pressing beforehand, when a layer of fabric is folded under and topstitched, a normal presser foot may scoot that top layer at a faster speed than the bottom layer. The risk for this is higher when you’re stitching farther away from the folded edge, such as on a deep hem. A walking foot helps keep all layers even so you get nice, flat edges. 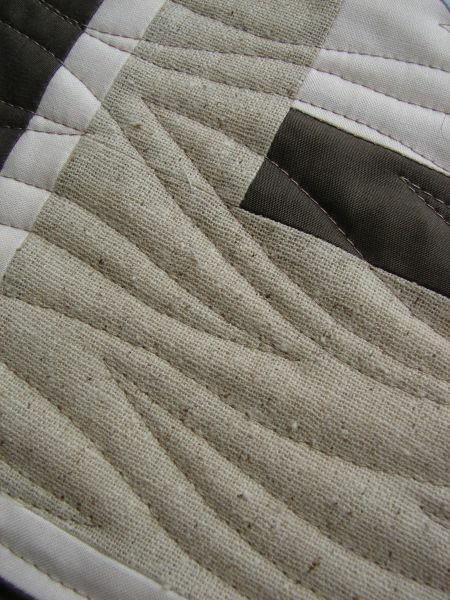 The walking foot keeps fabric and batting layers together while quilting. It is your best friend when machine quilting straight lines and large, gently curved lines. 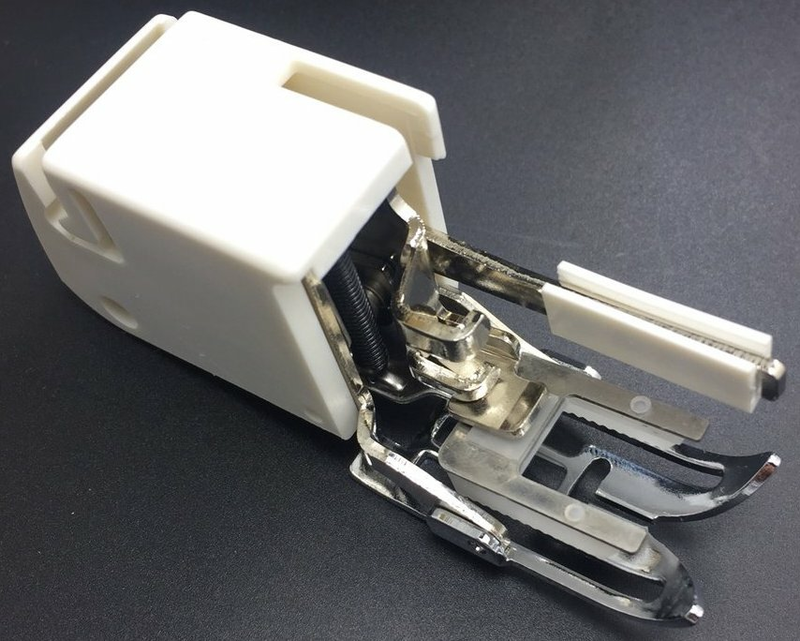 Reverse sewing: The foot isn’t designed for use in reverse. The top feed dogs of the walking foot will move the fabric forward and the machine feed dogs will move the fabric backward. 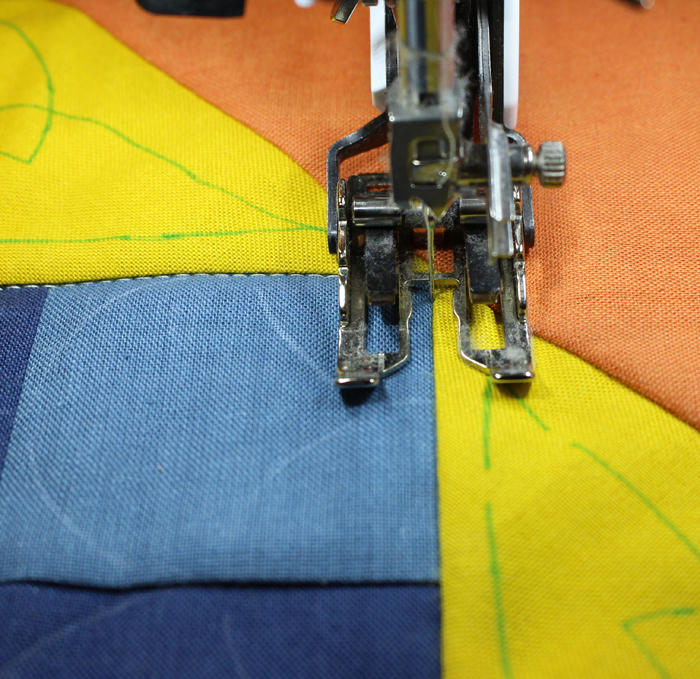 Free-motion quilting: The walking foot assists in forward movement and won’t allow the fabric to move side to side. Wide decorative stitches: Wide decorative stitches require side to side fabric motion, which is inhibited by the walking foot. There are two different versions of the walking foot: the classic version and open toe version. The classic walking foot has been around the longest and gives you all the advantages described in this blog post. Compared to the open toe version, it gives a bit better support to the fabric when the needle is pushed through the fabric. When extra visibility of the sewing area is not needed, this one is the one to go with, also because of the slightly lower price tag. The open toe walking foot gives you extra visibility and marks, especially useful when machine quilting and binding. Look for an open-toe walking foot if you do a lot of stitch-in-the-ditch, because this will help you see exactly where the needle hits the fabric. When you say “reverse sewing” does it include short securing start and finish reverse sewing stitches? I recently bought and started using my walking foot. Fabulous purchase.